Dr. Virit D. Butani is Board Qualified by the American Board of Foot and Ankle Surgery and is an associate of the American College of Foot and Ankle Surgeons. 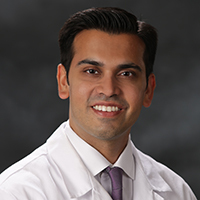 He completed his residency training at Medstar Washington Hospital Center/ Georgetown University Hospital in 2015 and then joined the University Podiatry Group at UCLA medical plaza. Dr. Butani is currently seeing patients at both the Westwood and Santa Monica offices. He is also a part-time Consulting Physician at the UCLA Arthur Ashe Student Health and Wellness Center. His interests include adult and pediatric flatfoot reconstruction, arthroscopic procedures, sports related injuries, trauma and diabetic limb salvage. In his spare time, he enjoys playing sports, traveling and spending time with family and friends.